A Head Teacher has given an account of her experience of inviting volunteers to her school to talk to the children about their jobs and careers. Tracey Lake, Head Teacher at Wheldon Infant School and Nursery in Castleford near Wakefield, has given a detailed account of the day’s activities and her delight in working with the volunteers who took part. She notes the enthusiasm and support the volunteers gave, sharing that an “army of volunteers in a steady stream all carrying bags of props linked to their job which they were keen to share with the children” arrived promptly and ready to get stuck in! Tracey, and her school, are clearly excited to continue raising the children’s aspirations and awareness of careers, and are already planning more inspiring events! 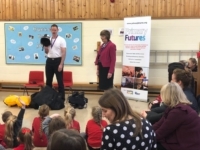 Primary Futures, working with the National Association of Head Teachers, worked together to help Tracey deliver this fun packed day as part of our Inspiring Wakefield campaign. If you are interested in becoming a volunteer, please sign up here. Or if you are a school looking to run a similar event, please sign up here.